JacQueline Sanchez Jewelry Design brings us a myriad of interesting and thought-provoking pieces. These make you stop and think for a minute as to what they might come up with next. They are very unique pieces in design and look. JacQueline Sanchez brings back the best memories of our childhood in one of her collections. She has several collections. These are You Puzzle Me, Forever Young, Open Mind, Photo Etched, Mokume Gane, and several Bridal pieces. 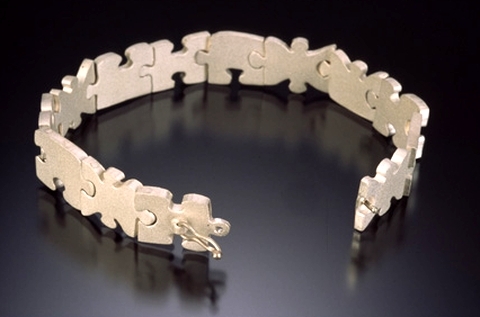 In the You Puzzle Me area, there are many different pieces of jewelry made entirely of puzzle pieces. There are rings, bracelets, and cuff links. The rings are made of silver and have a silver puzzle piece sitting on top of them. 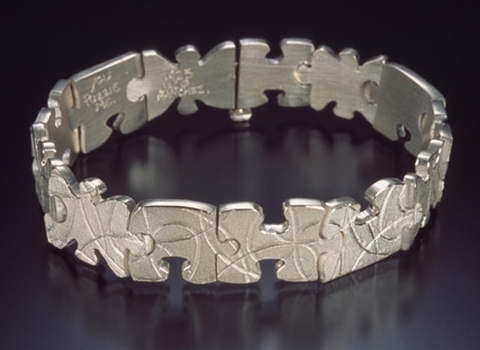 The bracelets are made of interlocking puzzle pieces that creates a nice circle. The cuff links have puzzle pieces sitting on one side of them. The Forever Young area is made entirely of Legos or building blocks from childhood. They have cuff links, bracelets, rings, necklaces, earrings, and pins. Some of these have diamond inlays on one side. The metal is silver and each piece is very unique. Legos are used to create pieces of jewelry with the block being on the top of a ring or the pendant on a necklace. The bracelets have many Legos that are fastened together on a metal framework. Open Mind is another category that has some very distinctive pieces. These are mostly rings made of silver and gold. They are not round like you would expect except for the inside hole. The outside is usually a square or half a circle or some other interesting shape. Black and white pearls and diamonds are used to enhance the look of these beautiful pieces. The shapes are more eye-catching than anything else. Take a look around and you will be sure to find something that you like. Photo Etched is a neat kind of jewelry. They have taken different designs and etched them into the metal of the jewelry pieces. Circles, leaves, and curved lines are used for the most part. These are mostly pendants for necklaces. Some come plain and some have diamond inlays. They are quite beautiful and very tastefully done. Mokume Gane is another unique set of jewelry. This set includes rings, earrings, necklaces, and bracelets. They even have one ring called a Mushring. It looks like it has a mushroom top sitting on it. 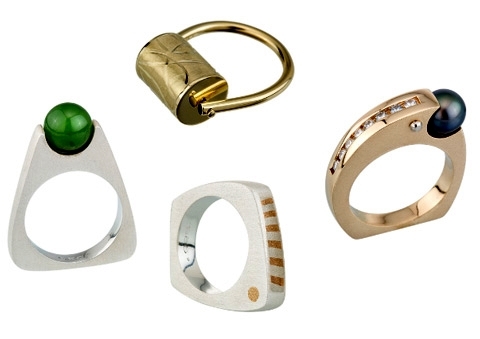 Some of the rings in this collection are reversible simply by turning the other side over. Some look like rollers sitting on top of the ring itself. The bracelets and necklaces both include several intricate designs you can choose. Earrings also come with the set. The Bridal collection has some very exceptional pieces that can be used for a traditional setting or a very modern one. Using both silver and gold in some pieces brings the great design out in them. The diamonds are exquisite in their settings. Some pieces are from the Open Mind category it seems with very circular insides and either square or hexagonal outsides. Some are wrapped around into two different layers. You can’t go wrong getting a piece for your Bridal set from here.